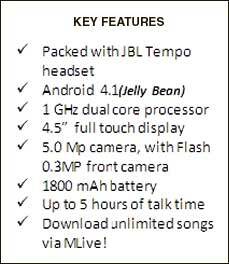 Device runs on Android 4.1 Jelly Bean mobile operating system and has a 1 GHz dual core processor. Strengthening its Canvas series,handset manufacturer Micromax on Wednesday launched Canvas Music A88 price at Rs 8,499. The new device marks Micromaxs association with the leading headphones brand JBL offering users a free JBL Tempo headset with the Canvas Music A88. The phone was showcased at the Micromax MTV Video Music Awards in Mumbai last month. Packed with an 1800 mAh battery,the phone ensures supports a talk time of 5 hours. The device runs on Android 4.1 Jelly Bean mobile operating system and has a 1 GHz dual core processor. The phone has a 4.5 full touch screen display and sports a 5.0 MP rear camera and a 0.3MP front camera with an expandable storage capacity of up to 32 GB. The Canvas Music A88 will be available across all leading retail outlets in India from May 16.